Python support in SQL Server, is a great move from Microsoft to challenge other technologies.SQL Server 2017 by default has in-built Python libraries to support the requirements. Let us quickly see the prerequisites for Python in SQL Server. As SQL Server 2017 has introduced support of Python script/code execution, Lets us download and install SQL Server 2017 Developer version as a first step. It is important for us to understand we need to select Machine Learning Services(previously known as R Services(SQL 2016) in “Feature Selection” while installing SQL Server 2017. Launchpad is an integral part of Machine Learning Services execution meaning to executing the Python or R code in SQL Server. 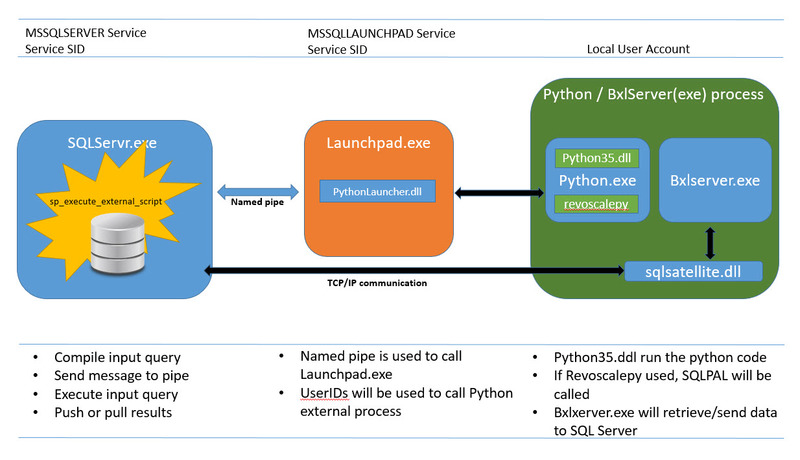 The below diagram explains the usage of Launchpad service. Note, This is important when you have multiple Launchpad services exists in the same environment and one of them have any issues that could not start, none of the Launchpad services may not start at all(manually). To be safer side, we can make this setting Automatic at initial stage. To run Python code in SQL Server, we need to use sp_execute_external_script system stored procedure. To use this procedure, we need to enable the configuration option “external scripts enabled” as below. This is important as “External Scripts Enabled” option is not a dynamic configuration that needs an explicit restart of the service to affect the changes. Now, we have set up the environment Lets quickly do a script execution. Thats it for now, hope you enjoyed the post.